- the night was cut short around 01:30 by high humidity. had decent seeing just before midnight after which the seeing went very bad. - was open at the beginning of the night but had to close just after twilight due to high humidity. - did not obtain any data tonight. Thunderstorms & heavy rain through the day & high humidity all night - did not open. Took HRS flats & arcs with the calsys + biases + internal ThAr arcs. Productive night in spite of the erratic seeing & a variety of technical glitches! Amazing night with great seeing in spite of high humidity! * A really superb, stable, photometric night with great seeing & a well-behaved telescope - the kind of night that eluded the HRS team the whole time they were out here! * Observed a P0 supernova for 2013-2-RSA_OTH-018 in twilight & then spent the rest of the night taking long-overdue HRS commissioning data for 2013-2-RSA_OTH-023. Marginal weather but quite good for ironing out kinks as we start HRS SV observations for 2014! Here is a guest post by Dan Milisavljevic about using SALT for rapid follow-up of supernova to discover some interesting things about diffuse interstellar bands. Optical spectra of the broad-lined Type Ic SN 2012ap during its first ~40 days after explosion. Three prominent DIBs around 4428 A, 5780 A, and 6283 A are highlighted with dashed lines. For close to a century astronomers that work with spectroscopy of stars at optical and near infrared wavelengths have struggled to understand small absorption features called the diffuse interstellar bands (DIBs). Over 400 features are presently known that regularly appear in and contaminate data. Enigmatically, however, the origin of DIBs have remained unknown despite exhaustive experimental, theoretical, and observational studies. It's an embarrassment in astronomy that these absorptions -- which are thought to be carbon-rich molecules associated with a large reservoir of the universe's organic material -- cannot be confidently associated with any known atomic or molecular lines. The Southern African Large Telescope (SALT) played a key role in this discovery. An ongoing program led by Robert Fesen at Dartmouth College was triggered to monitor the supernova in its early stages of evolution and obtain data of sufficient resolution to detect the DIBs. Additional supporting observations presented in the paper came from Harvard and Caltech facilities. The presence of DIB features provides information about the much speculated progenitor stars behind the explosions, and the fact that the changes in the absorption strength of the various DIBs were not uniform provides important clues about the location and physical traits of the source material. Supernova observations are typically made with low resolutions to maximize signal strength and wavelength coverage. However, Milisavljevic's work has demonstrated that this practice may not be good enough. Supernova light may be regularly transmitting a wealth of detailed information long overlooked because astronomers haven't been wearing glasses with a prescription strong enough to read them. Others: Brent. Hamish, Briehan and Lisa for short visits. Warm night with scattered clouds and variable seeing. Clear night with very poor seeing. Beautiful clear night with very variable seeing. Forced to close at 01:30 by dewpoint constraints. Clear, beautiful night with a warm breeze. Eskom power is back and the glycol is cooling down, so we should be operational tomorrow night. Another humid night. No data taken. Dairy farmer and amateur astronomer Stuart Parker from New Zealand has discovered a giant star exploding in a distant spiral galaxy named NGC 6984. The stellar explosion, called a “supernova” by astronomers, was observed for the first time in July 2013. Supernovae are very common, however this explosion was remarkable in that it appeared to occur in virtually the same position as a supernova named SN 2012im that had been found the year before in the same galaxy. Following his discovery, Parker immediately informed professional astronomer Dan Milisavljevic at the Harvard-Smithsonian Center for Astrophysics (CfA) who initiated a cascade of follow-up observations using international observatories to confirm the discovery and study the stellar explosion. The Southern African Large Telescope (SALT) located in the northern cape just outside Sutherland was the first professional telescope facility in the world to respond, within an hour of the original discovery, and has confirmed the reality of the supernova which has been officially named as SN 2013ek by the International Astronomical Union. Every couple of seconds a star explodes somewhere in the universe. These tremendously energetic events called supernovae shape the galaxies they live in and seed the cosmos with the raw materials of life. During the explosion the supernova is incredibly bright and can even be brighter than its host galaxy. However, the supernova quickly fades and may no longer be visible weeks to months after the initial explosion. however, astronomers were surprised to learn that sometimes supernovae can even be found right on top of one another! The question astronomers had to answer in this case was were the two explosions related? Or was this a chance alignment of two completely independent supernovae? 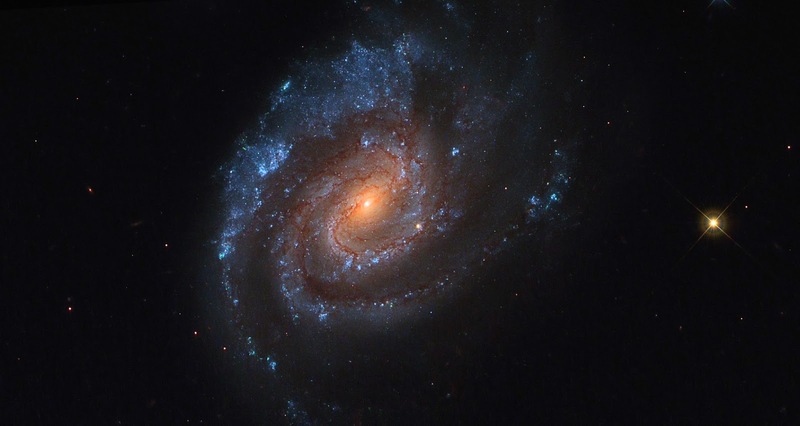 Milisavljevic believed that the rare discovery of two supernovae located so close to one another warranted a closer look with the Hubble Space Telescope (HST). He and collaborators asked for special permission to interrupt regular operations with HST to take a closer look at the supernova while it was still bright. Their request was approved and the resulting images obtained in August 2013 showed two separate objects in the region of Parker's discovery. One source was identified as the newly discovered SN 2013ek, but the other source was something unknown and possibly the previous supernova SN 2012im. Though the offset between the two sources in the images is very small, they are separated by an angle of only a thousandth of a degree, at the distance of the host galaxy (approximately 200 million light years away) it implies a large physical distance that makes an association between the two explosions nearly impossible. Milisavljevic stresses that the nature of the second source is not certain and could easily be an unrelated nearby cluster of stars. Another observation with the Hubble Space Telescope could firmly resolve whether the second source is actually SN 2012im. He plans to observe the galaxy again this year. "By waiting a year to take another set of images with the Hubble Space Telescope," says Milisavljevic, "we can do a nose count to see what is left behind." Milisavljevic is presenting the results of his study of supernova SN 2013ek at the 223rd annual meeting of the American Astronomical Society during January 5-9, 2014. Lost the night to thick clouds and occasional rain. Fred and Vic. No observations. clouds rolled in thick just before midnight. Photometric dark night, but with mediocre to poor seeing. Dark and clear night, though mostly non-photometric. Seeing was not good, jumping on both sides of 2". - happy new year! we went into 2014 with bad seeing for most of the night which changed one hour before twilight when the wind turned North. was a bit of a frustrating night. - hope everyone enjoyed their new year's celebrations.